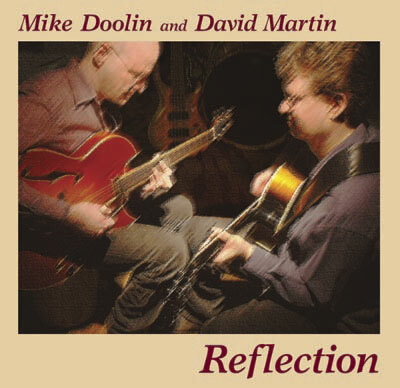 Mike Doolin and David Martin "Reflection"
I was playing at Clyde's Prime Rib with the LaRhonda Steele Band one night in the spring of 2008, when David Martin walked up and introduced himself as a guitarist and bassist, moving to Portland soon and looking for gigs. As it happened, LaRhonda was looking for a bass player at the time, as was another of my bands, the Chris Baum Project. So, I hooked David up with those two bands and we started playing together. Then when David got a gig at Amalfi's Restaurant that called for a duo, he called me, and we played as a duo there until evenings got too cold on Amalfi's patio to play. In all these musical settings, David and I found a great deal of common ground. We both play bass and guitar, we both play R&B, Funk, Rock and Jazz, we both play both acoustic and electric instruments, and we're in to a lot of the same people - Mike Stern, Scott Henderson, Pat Metheny, Ralph Towner, John Scofield. And on our duo gigs, we started playing one another's original compositions, where we found even more commonality of direction. So, since I had recently built a home recording studio and had all the necessary gear, we decided to record a CD of original music. We used Ward Griffiths on drums throughout. The three of us would get together about once a week to bring in a new tune, read through it a couple of times, and record a few takes. Most of the time, whoever wrote the tune would play guitar and the other would play bass, but there were some exceptions. Then with the basic trio tracks recorded, David and I would come back later and overdub to our heart's content. The entire project was recorded within a span of about two months. 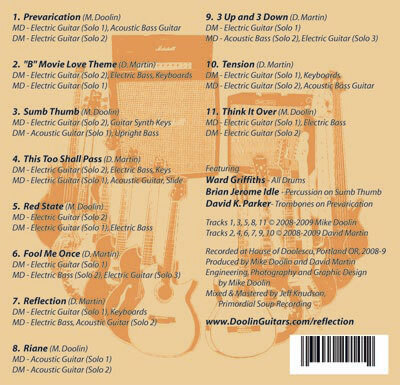 We ended up with 70 minutes of music in 11 tunes, 8 of which we wrote during that time for this project. I enlisted the aid of Jeff Knudson of Primordial Soup Recording as mixing and mastering engineer. I also brought in David K. Parker to play trombone on one tune, and Brian Jerome Idle to play percussion on another. All in all, it's a CD of old and new friends and musical compadres, having a great time playing one another's music.